Shanghai Disneyland has a lot of deviations from the standard Magic Kingdom model, but there are some familliar sights as well, even if they're not completely the same as their original versions. At the end of Mickey Avenue--Shanghai Disneyland's entrance area that replaces a too-American Main Street, U.S.A., there's a familiar tower that seems to look a lot like Disney California Adventure's Carthay Circle Restaurant. It has no such dining role in Shanghai. Instead, it's just an architectural feature anchoring a prominent corner at the transition of Mickey Avenue to the Gardens of Imagination. 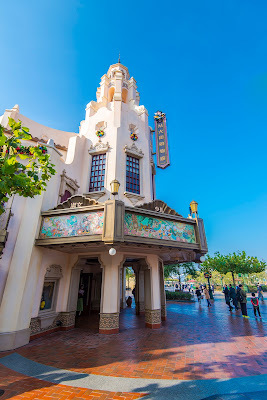 But it's a Disney connection, which makes for a bit of a surreal experience for any Southern Californian Disney fan visiting the newest Disney park!